Contact Mance for info and pricing on having your drum re-skinned. 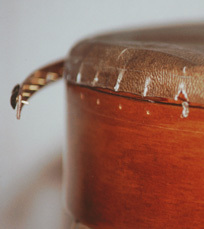 Here you can see the damage that occurred when the bodhrán maker (who shall remain nameless) adherred a too-thin skin using a method that offers only the thin shaft of the tack to keep the skin in place. It's only a matter of time before ripping occurs with a drum constructed in this manner. 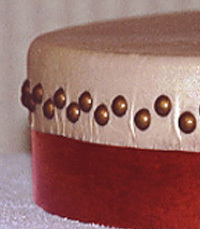 The new skin is securely affixed to the rim.